Nucleonica: Core Applications and Case Studies, 27-28 November, BfS Berlin, 2013. This 1-day training course took place at the offices of the Federal Office for Radiation Protection (Bundesamt für Strahlenschutz BfS) in Berlin, during the 27-28 November 2013. The course focused mainly on the Nucleonica core applications and tools and the use of the Nucleonica standalone software. A detailed description of nuclear data with particular reference to the various Nucleonica nuclear databases was given. Core applications were demonstrated through the use of Nucleonica tools such as the Decay Engine, Dosimetry and Shielding and the Gamma Spectrum Generator. Two nuclear security related case studies showed how the various Nucleonica applications could be used in real-life emergency situations for nuclide identification and nuclear material characterisation. In total, 10 persons took part in the course from the various BfS locatins in Germany. Speakers included Drs. Z. Soti from the JRC/ITU in addition to Dr. J. Magill and Mr. R. Dreher from the Nucleonica team. 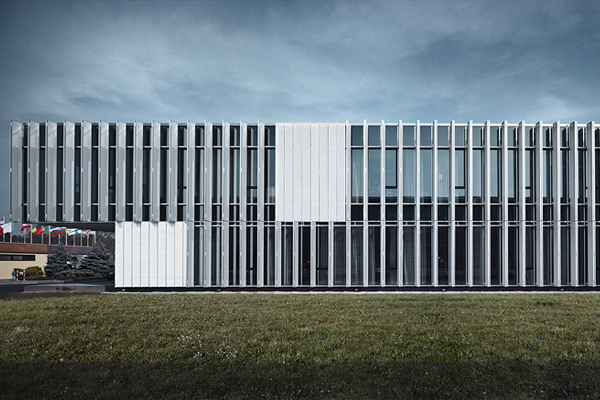 On Thursday 21 November 2013, The JRC’s Institute for Transuranium Elements (ITU) in Karlsruhe celebrated its 50th anniversary in its new office buildings. For this special occasion a “birthday present” of a unique mosaic version of the Karlsruhe Nuclide Chart has been laid down in one of the Institute’s open-air courtyards. This mosaic work of art is almost 100 square meters and weighs about three tons. 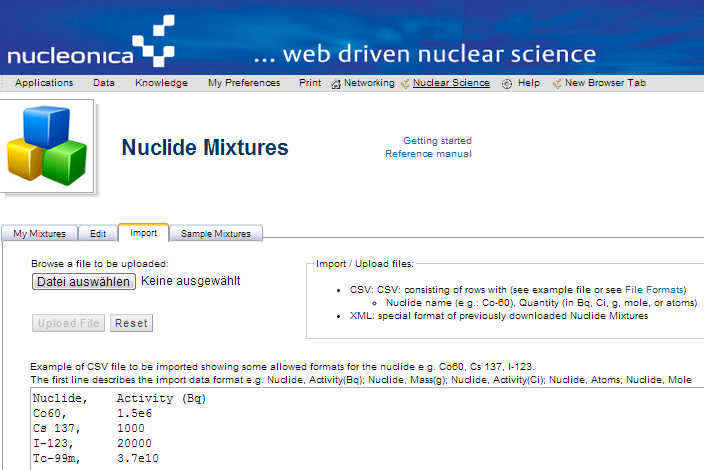 Users can now upload/import csv-files directly into the Nuclides Mixtures application. Following a request by Fz-Juelich users, the Nuclide Mixtures application has been extended to allow importing/uploading csv-files, for example created from spreadsheets, computer codes, experiments, etc. Previously only xml files created by the application could be imported. Currently the number of nuclides in such files is restricted to 100. • A set of lines each of them containing a set of values described by the entries of the header line.